So, early on in the Kickstarter for Numenera we added a bestiary as a stretch goal. This bestiary will be filled with creatures, but will also have some characters and character types, because not everything that you interact with is a “monster.” Plus, in the Ninth World, some things that seem like monsters are actually potential allies, and some things that look harmless most certainly are not. NPCs (including creature of all types) in Numenera do have the same kind of stats as PCs. As simple as it is to make a Numenera player character, it’s far simpler than creating a PC. Or, to put it a different way, each NPC is precisely as complicated to make as the GM wants it to be. Everything in the game system can be given a rating from 1 to 10. This is true of an animal, a town guard, a door, or an artifact. Basically, the GM is deciding on this rating for his or her world’s own internal consistency. From a game mechanics standpoint, there is no right or wrong. (If you’re coming from 3rd or 4th Edition D&D, I can’t stress this enough.) This rating is much more important from a verisimilitude standpoint than a mechanical one. While characters too have ratings (levels), there is only a casual correlation. It’s a handy guideline, but not a rule. You don’t just use rating 1 stuff if the PCs are level 1. You use rating 1 stuff if it’s appropriate to whatever’s going on in the story. Your beginning characters in Numenera will likely encounter stuff with a rating of 3 or 4 right out of the gate. And maybe more. It’s okay. Once you’ve decided on the rating, you get a target number. Target numbers are basically the rating times 3. That’s its target number for everything. So in a fight, a PC fighting a level 4 opponent has to roll a 12 or higher to hit, a 12 or higher to dodge from the foe’s blows, and a 12 or higher to affect it with some weird effect from a device. Even if it has special stuff going on, it’s stilled keyed off that number. If it’s poisonous, the roll needed to resist its poison is 12. Etcetera etcetera. Its entire “stat block” is 12. Of course, to keep things interesting, there are other factors, but each is unique to a given NPC. Some NPCs might be rated as being really good with a particular attack, and thus gain a bonus to their base number. So a level 4 automaton that blasts foes with an extremely accurate energy blast might be a 12 on everything, but a 15 with its blaster. NPCs and creatures, of course, can have all kinds of weird powers or weaknesses, and they might have armor or special weapons. But these exceptions are all layered on top of an extremely simple core with a single default score. So they never get very complex. The point of this kind of design is to keep things really, really simple unless they deserve to be more complex. If the town guard is gullible, your GM notes might say, “Level 3 guard (9), can be easily tricked (6).” You added a tiny bit of complication with that last clause, but you did it because it makes the encounter with him more interesting and to quantify the world you’re crafting. So the tiny complication is absolutely worth it. Adding notes and mechanical alterations because of the guard’s cooking skill and his predilection with metallurgy probably isn’t worth it. And best of all, really straightforward creatures, like the dreaded stiletto beetle and its nasty stinger, can be represented entirely by one number with no exceptions, and it will still be an interesting, quick encounter. This also tells you how characters interact with the rest of the world. If a locked door has a rating of 5, it will take a roll of 15 or higher to bash it down. Or pick it. Or phase through it. Or whatever. Like an NPC, these simple stats can be altered with specific exceptions. So the level 5 steel door might have a substandard lock that only requires a 9 to pick, for example. It’s important to note that creature toughness or any other kind of difficulty in the game is a matter of the GM giving meaning to the fictional reality of the setting, not performing game mechanical mathematic surgery. There is no concept in Numenera of “a challenge of N level is appropriate to a party of N+X level characters” or anything of the sort. As I’ve written earlier, PCs don’t get XP based on defeating foes or bashing down doors. So there is no right or wrong. That said, the Numenera corebook will be overflowing with examples of standard NPCs, objects (particularly cool numenera artifacts), challenges, creatures, and so forth. And the follow up books will present even more. These will work as references, but more importantly as a way to teach GMs to create their own–even on the fly. The point here is to keep the game focused on the story and the cool ideas. If the GM doesn’t have to keep a lot of numbers and die rolls in his head, he can spend his time thinking about what might happen next, or what the implications of PC actions might be. And if the “stat blocks” aren’t bogged down with lots and lots of numbers–many of which might never come into play in the relatively short encounter–there is more room to discuss the cool ideas behind the NPC. In other words, if you encounter a woman who can walk through walls and remove single memories from your mind with her touch, that’s the cool and important stuff we want to focus on. 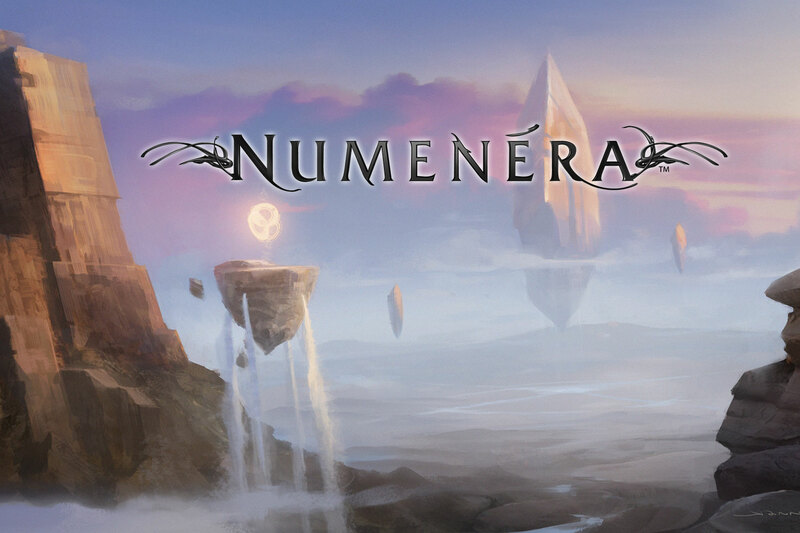 Numenera is a game about the characters and ideas that make great stories. The Ninth World is the setting for my new Numenera roleplaying game. I’ve described it as a far future post-apocalyptic setting. Basically, it’s the backdrop of a young civilization that has grown up amid the ruins of very old, very advanced civilizations. A billion years from now, we are long gone, as are the civilizations that evolve and rise (and fall… or leave… or transcend) after us. And the one after them. A billion years is a long, long time. It’s far more time than there is between us today and the dinosaurs. In the time of the Ninth World, the land masses of the planet have returned to form a vast supercontinent surrounded by seemingly endless seas with extremely dangerous storms. But is the Earth in the configuration it is because of natural forces and simply the march of time or did some prior civilization design it to be so? Certainly the ancient inhabitants of the so-called “prior worlds” had the ability to shape their planet–and likely other planets–as they saw fit. Proof of this is everywhere. “Impossible” landscapes are a normal part of the Ninth World’s topography. Islands of crystal float in the sky. Inverted mountains rise up above plains of broken glass. Abandoned structures the size of kingdoms stretch across distances so great that they affect the weather. Massive machines, some still active, churn and hum. But for what purpose? Along the southeastern coast lies The Steadfast, a collection of kingdoms and principalities with little in common except for a unifying religion. This religion, called by its adherents The Order of Truth (and by all else as the Amber Papacy), reveres the past and the knowledge of the ancients as understood by the enigmatic Aeon Priests. By decree of the Amber Pope, The Steadfast and The Order of Truth wage war with the lands to the north, believed by many to be enthralled by a secretive and mysterious cult called the Gaeans. Nobles amid The Steadfast are called to the Crusades, making war against the infidels with ever stranger weapons discovered or devised by the priesthood. Beyond the bounds of The Steadfast, however, lies The Beyond, a vast wilderness punctuated by very occasional, very isolated communities. The Beyond also has its Aeon Priests, but these are not linked by any kind of organized network. They do not answer to the Amber Pope. Instead, they dwell in sequestered claves. Around these claves, small villages and communities known as aldeia have arisen. Each clave has discovered and mastered various bits of numenera, giving every aldeia its own distinct identity. In one, the inhabitants might raise unique bio-engineered beasts for food. In another, people may pilot gravity-defying gliders and race along the rooftops of ancient ruins. In still another aldeia, the priests in the clave may have developed the means to stop aging almost entirely, making the residents immortal and willing to sell their secret–for an incredibly high price. Because the villages are remote and separated by dangerous distances, trade of these discoveries is occasional and haphazard. But not every village or tribe in The Beyond has a clave to help guide them amid the dangers of the past. Some of these have discovered the numenera to their peril, unleashing terrible horrors, plagues, or mysteries beyond comprehension. Travelers might find a village where all the residents have been transformed into flesh-eating monstrosities, or another that whose populace works as slaves for some machine intelligence left over from an earlier era. Outside the aldeia and other settlements, the dangers multiply. Amid the ruins of the past lie tribes of vicious abhumans, as likely to kill and eat an explorer as talk to her. Clouds of tiny invisible machines called the Iron Wind scour the wilderness, altering everything they touch. Monstrous predators, ancient death machines, and stranded extraterrestrial or transdimensional beings also all pose a threat in the uncharted reaches of The Beyond. But so too can a careful and capable explorer find awe-inspiring numenera that can accomplish anything one can imagine. In the Ninth World, numenera is both the risk and the reward. As I have written in the past, I struggled with the right dice to use in the game. I was tempted to use a d10 for quite some time, and I flirted with the normalization afforded by a bell curve of some kind. On a 17 or 18, you get a Minor Effect. Basically, if this is a successful roll, you get to state something special that happens as a part of that action. Maybe in your jump you land with a flourish, or also knocked over the burning brazier onto the curtain to start a fire. Attack rolls with a Minor Effect either do additional damage or affect foes in some way–knocking them back, for example. On an 18, any points you spent on the action (such as through effort) are also reduced. On a 19 or 20, you get a Major Effect. This is similar to the Minor Effect, but, you know, bigger in some way. You not only kick in the door, but momentarily intimidate all the foes on the other side. In battle, Major Effects do more damage or affect the targetsdramatically–knocking them down, disarming them, etc. On a 19, any points you spend on the action are reduced. On a 20, whatever points you spent return to your pool. If the GM decides that the effect that you describe has a chance of failure, there may be a second roll involved. (Something simple, like adding damage in combat, never requires a different roll.) It’s worth noting that damage in Numenera is based on your weapon and other factors but isn’t random. So the variability in damage comes from Minor and Major Effects, not in a separate damage roll. Not only does this keep things moving faster, but it always means that if you roll well in combat, you’ll do better damage (or get a special effect). In the end, this means that with a typically sized group, there will be a special roll of some kind once or twice each round, which makes for very dynamic, exciting play. The other dice that you need to play Numenera are 1d6 and 2d10 (percentile). The d6 is used only in rare instances. It’s almost inconsequential, but I figure everyone’s got a six sider laying around, so it’s not a strain to call for it occasionally. The percentile dice are used by the GM when rolling for various random things that only the GM rolls for. The Numenera book is going to be filled with lots of tables for the GM, mostly to help in adventure creation. Tables about the weird aspect of an isolated community, about mutations, about bioengineered effects, about incredible devices, and much, much more. As a game about ideas, I want to ensure that no Numenera GM ever runs out. (And the best thing about tables is, if you don’t like random generation, you can just pick what’s appropriate.) These tables will always be percentile based. So since GMs don’t roll for NPCs, the 2d10 become the GM’s dice.